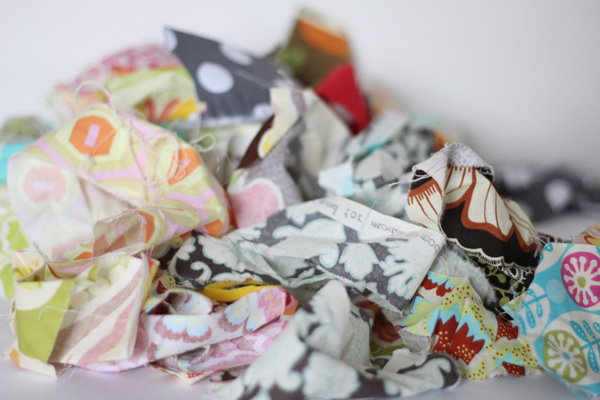 For this project, you’re going to need a lot of different scraps, 50 of them. So just go over and PULL your scrap draw out. You can just throw them all over the floor for this one. And don’t weed out fabrics if they are unique. I used a fleece for North Dakota (because I think I’d want one there! ), a knit for Kansas and a silk in Illinois. It adds some neat dimension to use different fabrics. Next, go over here and print off this map, in poster size. I copied the image to Paint(high tech, I know.) and then printed it. 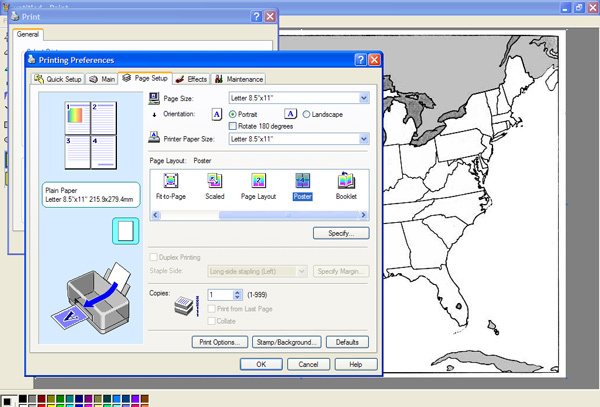 To print in poster, go to your printing preferences > Page setup. In the screen shot below you’ll see the Poster option highlighted. Tape it together, overlapping and trimming as needed. Then cut out California. California is a good state to start with because it comprises most of the west coast and gives you a base to build from. Now find a piece of fabric that you think represents the state in some way. Here’s an example with North Dakota. Cut out a piece of heat n bond, large enough for the state and iron it to the back of your fabric. Let it cool and peel off the backing. Pin the state to your backed fabric. Then iron to a piece of muslin in it’s spot. I made sure to cut out one state at a time so I didn’t get any mixed up. Keep going until you have all the states on there! Just keep going, working your way from the west coast to the east coast. Those northeastern states are little and tricky, but you can do it! When you’re finished, Colorado will be your new favorite state. Perfectly rectangular. When they are all ironed on, topstitch around each state. This is the most time consuming part, but the most important. It will give each state the definition you want! Before topstitiching, you won’t like your map as much as you thought you would. But, when you topstitch, you’ll love it! Just remember that because this tedious. Backstitch where necessary to keep your stitches sturdy. Next, I stretched it around a piece of plywood and glued the back. I just used a glue gun for this step. Then glue on a piece of lace on the back and you’re ready to hang it! *Since you’ll be sewing through this, the best heat-n-bond to get is the purple one. I used red, since that is what I had on hand. But purple is more lightweight and won’t make your needle sticky. 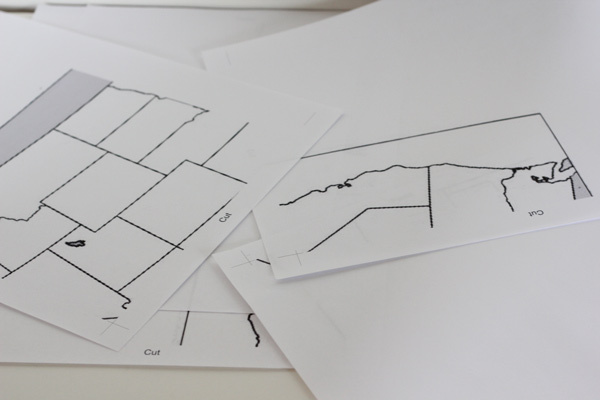 When I do this kind of ‘work’ I print a mirror graphical image and trace the pieces one by one (I usually just mark them) on my Vliesofix (kind of Heat and Bond I guess), cut roughly, iron, cut neatly. Or, if printing a mirror graphical is too difficult I place my ‘poster’ backwards on a window to trace the pieces. That is a great idea! Love it. As a geography major, this is the coolest thing ever! one of the greatest things ever! i LOVE LOVE LVOE this. Firstly, I think that I may be obsessed with all of Kate’s creations. I love this idea. I will have to put it on my summer craft list. I have been wanting a map for the boys, and this way it would look phenomenal in the hallway. I already made one! I was home with a sick kid on Monday and while he napped I cranked one out. I need to top stitch still but it’s darling! Wanted to let you know that I love this idea and am linking back to you!